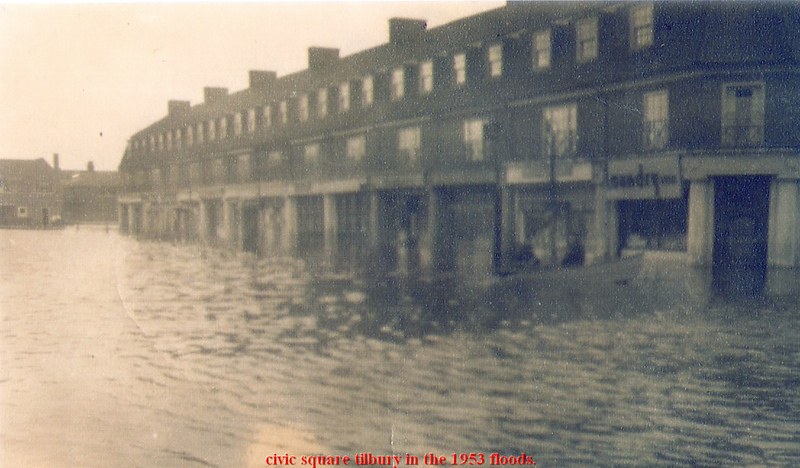 Civic square from left to right under the deluge of water from the river Thames in January 1953. 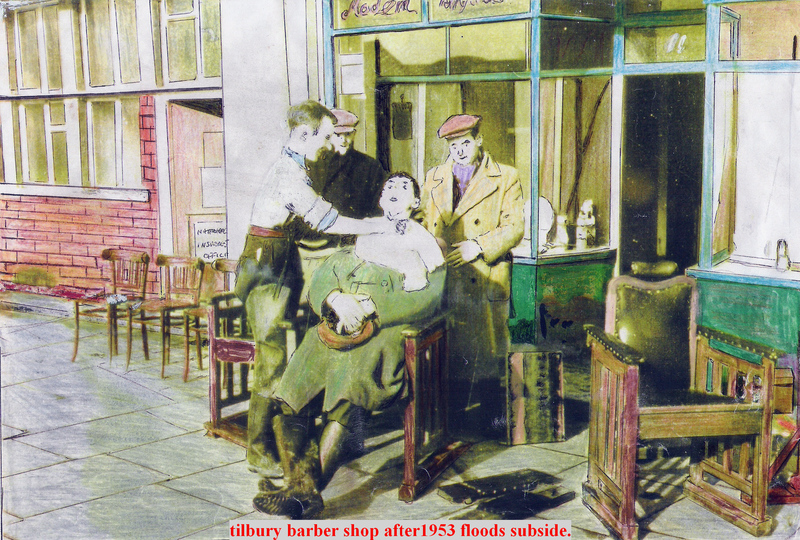 Can anybody remember the name of the Tilbury barber outside his shop, after the floods? Hi, yes its my dad Jim, the painting is odd as we actually have the photograph of that, I believe was published in the Gazzette or another local paper at the time, so someone either copied the photo or its a cumputer generated image. Hi Bill I remember you well from Thurrock cycle speedway. Happy days. 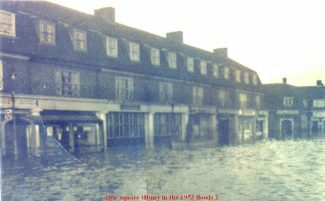 No doubt it is Jim Tindale in the painting the real give away is in the picture bottom left on door National Insurance Office and that was next to Jim’s shop. The Food Office is a large black nissen hut building opposite in Fire Station yard. 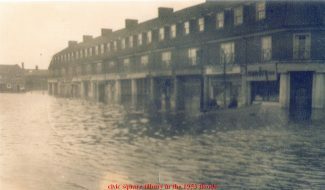 Jim Tindales was in Civic Square during the floods, we have some photos showing the aftermath, and he was there until he retired, my husband John is Jims nephew and worked in the shop from leaving school until about 1971. 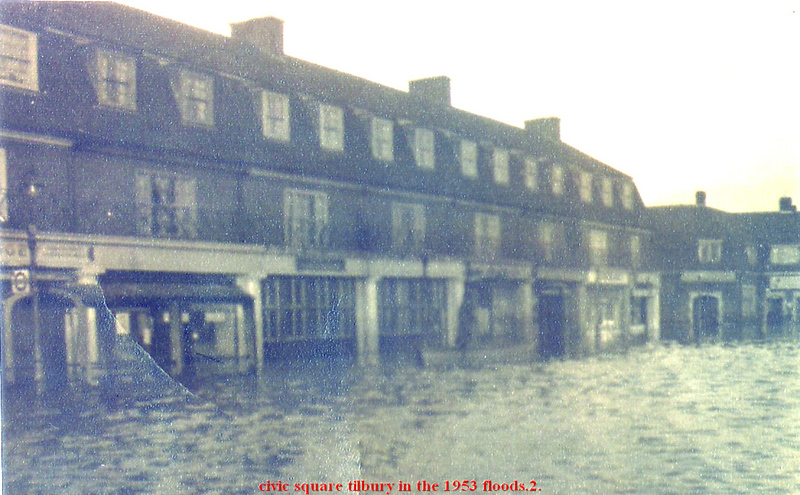 I think Tindales was in St Chads Road in 1953! Hello Elaine. Thank you for your comment (second one of course), no its not Christchurch or Dock Road. It was taken from a newspaper cutting at the time of the floods and transformed into a sketchy drawing as I understand it. So there you go. hello Elaine Holmes. The barber in civic square is actually Jimmy Tindale shop no 11 to be precise and it stands in civic square today,under a new name. i did a research on it recently and found out it was civic square. If this is the barber in Civic Square the one I remember is Jimmy Tindale.